The sun sets quickly and strangely in Mistissini. Once it’s gone, the sky stays lit for longer than one might expect. This is called twilight, of course; I have also learned that there are phases of twilight . . . three, in fact! (Civil, Nautical and Astronomical) So while the days are a little shorter by about a quarter hour here north of the 50th parallel, twilight is longer. A fascinating, magical time of day. In Mistissini itself, one gets by just fine communicating in English – even in the workplace where there is a fair bit of French. On the other hand, in Chibougamau (an hour away and the go-to for a bigger grocery selection), you’d better dig out your French. When it comes to Cree, there’s no demand for it, but the way I see it, why wouldn’t you try to learn the language of the gracious people who are sharing their land with you? Almost every grocer and convenience store in Quebec sells amazing pastries. Even the Twinkies are different in Quebec! There are probably more friendly people per capita in Mistissini than anywhere else in the world! The Cree word for “Welcome” is “Wachiya” – and it is the unwritten mantra of almost every local person I’ve met. Mistissini means Big Rock. There’s too much snow to find the rock to which the name refers. Snowshoes are a helpful accessory. 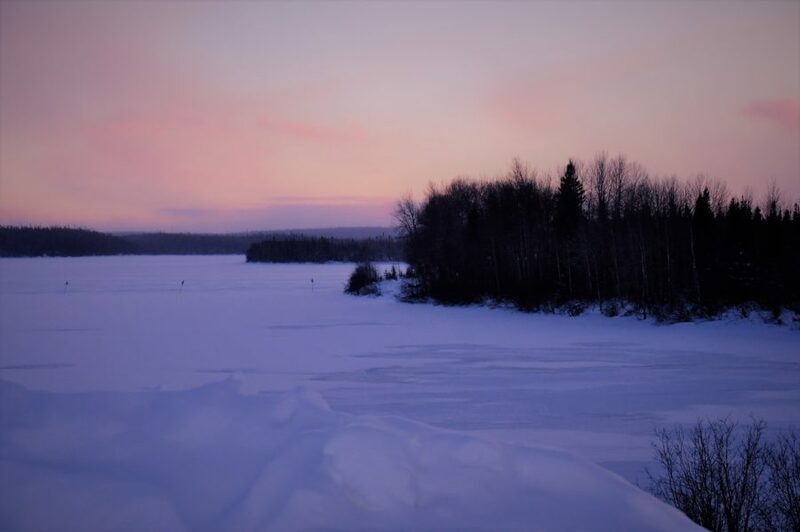 There’s a lot in a name – this land used to be called Baie-James (so named by the Quebec government) but a few years ago (2012) the government allowed the Cree Nation to rename the land Eeyou Istchee (pronounced just how it looks). It means Land of the People. There are nine communities of Crees within Eeyou Istchee, which extends from Mistissini north to Whapmagoostui (Great Whale) on Hudson Bay and west to the communities of Eastmain and Wemindji on James Bay. About half of the communities are coastal. I will travel to all of them. 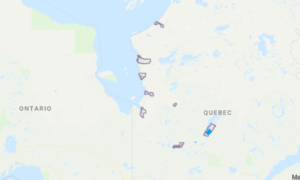 There’s another community that wants to join the Eeyou Istchee population: The MoCreebec are Eastern Cree who live on the other side of the Quebec/Ontario border. Because they did not live on the Quebec side, they were left out of the treaty agreement of the 1970s. They have now the backing of the Cree Nation in their fight for the right of recognition as Eastern Cree, despite where they live. Read More The logistics of what this will mean governance-wise have yet to be worked out. Read here about another group of Eastern Cree – Washaw Sibi – that has been fighting for a similar right. There’s so much more to pronunciation than simply sounding out the word. For example, Mistissini is often mispronounced Mih-Stih-SIN-ee when in fact, it is a Cree word, pronouced with Cree inflection as Miss-TIH-sih-nee, with the last two syllables slurred together. Nemaska is mispronounced Neh-MASS-ka, when it is really called NEH-muss-kuh. Chisasibi is not Chih-sah-SIH-bee, but rather Chih-SAH-sih-bee, with the final two syllables slurred.